Freelance financial consultant and car enthusiast living in Scranton, PA and writing for AmericanAutoMove.com. Why hasn’t a car company designed a remote control window system? Greetings blog followers! With the recent muggy and stormy weather coming to the northeast, I had some thoughts that I wanted to share with all of you. It all starts with a question that I haven’t been able to answer. The other day I had a late meeting in Philadelphia. I was going to spend the morning working from home and then leave for the meeting around 1pm. It was supposed to be a hot day, so I went out to my car early and cracked the windows on each side. The idea being that my car would be at least slightly cooler with some ventilation. Roughly two hours later, it started raining. I grabbed my umbrella and ran to the car to close the windows. As soon as I went outside, my umbrella closed on itself (and me) and I could not get it open again. Then I stepped off the curb into a gigantic puddle, straight out of the movie Groundhog Day. The rain continued to pour down on me as I got in my car, closed the windows, and went back inside. I was soaked from head to toe. Then I had a thought, if they make a keyless remote entry for your car, why hasn’t someone developed a remote that could close your windows? It would be useful in all sorts of weather related situations (yes, including my recent debacle). Imagine if you were in a meeting and you could see through the windows that storm clouds were rolling in. Think of how great it would be if you could just reach into your pocket, hit a button, and know your windows were closed. Even if you weren’t in a meeting, what if you were sitting at your desk and could see it started raining outside? Just the push of a button and you’d know the inside of your car was protected. This system would even be useful at home. Perhaps your family BBQ, which was going all morning with no weather issues, was in the process of getting rained out. Between carrying the potato salad and the paper plates inside, you could easily forget your car windows were down. You could successfully get into your house, remember your car windows are open, hit a button, and close them up. With a remote control window system, you wouldn’t have to go back out in the rain ever again. Car companies are always improving car technology, lately in leaps and bounds. Let’s make this a new leap, eh? I recently discovered something rather incredible on YouTube. Yes, I am aware that some of the following videos I’m about to comment on are probably fake. Although I’d go as far as to say a LOT of videos on YouTube are fake, but that doesn’t stop them from being awesome. Here’s a little background on how I got to the videos, then you’ll see what I’m talking about. Back when my parents had the moving company, they would bring me to work with them when I was off from school. After a while, my Mom insisted that my Dad get some toys for the waiting room. Although we never had that many people waiting at any given time, this was a very good idea. That kind of thing always keeps kids occupied. So my Dad set out to find appropriate toys, that would mostly be played with my be. You should have seen the look on my Mom’s face when he brought home Hot Wheels cars and accessories. I spent hours playing with those cars and making tracks around the room over the years. I was just thinking about all of that a couple weeks ago while I was looking for sports car videos on YouTube. I began searching around for stunt driver videos and found “Team Hot Wheels”. This is a team of professional stunt drivers that both reenact classic Hot Wheels stunts and break long distance car jump world records. Not only do they perform some incredible stunts, but they also have plenty of incredible videos showing off what they can do. While some of these Team Hot Wheels videos and stunts are a bit over-the-top, and probably subject to some CGI, many of them are very real. For the purpose of this post, I have separated the videos into “real” and “not-so-real”. Caution, many of these stunts are genuine and performed by professionals. Please do not try any of these stunts with your own car. This video was shot at the 2012 X-Games in Los Angeles, CA and is certainly real. In front of a massive crowd, the drivers speed their respective vehicles through the giant 6 story double vertical loop. Yet another video of the double loop dare. From those tiny orange tracks in a kid’s living room, to a full-scale crowd pleasing stunt. At the testing facility, the team works hard to develop their stunts. Tests must be continuously done and every aspect of each stunt thoroughly checked. In this video, the team prepares for a four-wheeled vehicle distance jump. The goal is to break the previous record for such a feat. Watch this Team Hot Wheels stunt driver break the four-wheeled vehicle distance jump record at the Indy 500 in 2011. He drops down on a ten story ramp and flies over three hundred feet. A crowd-shot video of the record breaking stunt. The yellow driver’s identity is revealed after breaking the world record. His post-jump interview is not only enthusiastic, but also inspirational. It’s amazing what you can do with a car when you set your mind to it. Hot Wheels Team Green break another record, this time for the Corkscrew Jump. Soaring 92 feet into the history books, at least until they break that record again. Watching these videos tell me lots of things, but mainly that this progress isn’t over yet. Follow the additional link on the page to get a behind-the-scenes look about this jump. For all the “drifting” fans out there. Here’s a video of Team Hot Wheels’ Blue stunt driver doing the best donuts I have ever seen. What you have seen so far is real. However, once the team is done shooting their driving and stunts, sometimes the production team turns the footage into videos that are a bit more fantastic. Yes, by fantastic, I mean fake. Lots of videos on YouTube are fake. At least the Team Hot Wheels “fake” videos are awesome, check out some of them below. Remember the old stock car electric tracks that had part of the track going up the wall? Imagine that on a full-scale and with drifting. The result is this video. Since I cannot confirm this stunt is real, I must label it as fake also. The Team Hot Wheels red driver jumps off of a moving semi truck. Skip to 4:38 for the most ridiculous fake stunt driving you have ever seen, ever. It literally looks like a dream brought to life through imagination, Hot Wheels, and a computer. Hello and Happy Friday everyone! This week I’m continuing to deviate from my “Super Speed” blogs to do something a bit more fun. Warning, if you’re reading this at work, it could distract you for the remainder of the day. Especially with the three day weekend coming up for some of you. Enjoy! I do a lot of commuting for work. If you follow me on twitter @jeannelonghorne, you’ll see that my commuting is split between taking the train and driving. In my years of driving from city to city, I have seen my fair share of stupid drivers. I don’t necessarily think that these drivers are being intentionally malicious with their driving. However, I don’t think they realize just how dangerous their bad driving habits are. Simply choosing to ignore basic driving safety makes you a dangerous driver. Those turn signals, brakes, mirrors, and headlights aren’t just there for show, you have to use them by law. For some reason, not everyone understands that. Since my last blog post featuring YouTube videos was so well received, I took the same approach with this week’s post. I searched for, and found, the 13 best YouTube videos of stupid drivers. Please note that not all of these videos featuring bad driving resulted in accidents, though that is the most typical outcome. It’s never a good idea to take chances on the road. Watch this particularly brainless driver cut and swerve around semi-trucks on the highway. Talk about a near miss. My Uncle Mike used to be a truck driver until he retired back in 2006. His biggest regret, never getting, setting up, or owning a dash-cam. To quote him directly, “I’d have one hell of a ‘YouWhoob’ account right now if I had a dash-cam back then”. I love my Uncle. This driver is definitely oblivious to the car that is driving behind him. On such a rainy day, he decides he doesn’t like the other car and repeatedly “checks his brakes.” Sure, he could just pull over and let the other driver pass. Well, eventually he has to, but that driver doesn’t just pass. I guess that wasn’t a ski rack on top of the car. A short video of rear end collisions caught by red light traffic safety cameras, courtesy of the New Jersey DOT. You won’t believe some of these. It blows my mind when people don’t open their eyes and stop for red lights. The life you save may indeed be your own. The video also provides some rather insightful statistics about traffic safety and red lights. This driver has just plain “snapped” and is driving a semi-truck down the highway in an incredibly dangerous manner. The clip is taken from one of those “Most Dangerous Drivers” TV shows, which my Dad loves. Don’t pull off dumb stunts in the middle of the road at night, you never know who’s around. This show off gets a wake up call after nearly hitting some pedestrians. When heavy traffic is around, that’s not the best time to show off how fast your car can go. Remember, stupid drivers are dangerous drivers. We’ve all been stuck behind this person before. Someone who seems to have no idea where they’re going or even how to drive. The result isn’t just a stupid driver, but an incredibly dangerous one too. This stupid driver jumps out in front of speeding bus, causes a huge crash, and then drives away. There’s no way he did not know the damage he caused. Yet another case of a stupid driver that is also incredibly dangerous and irresponsible. What is this driver even doing? Presumably they are trying to park, though they certainly seem to be making it as difficult as they can on themselves. I don’t know what I like more about this video, the footage or the music that’s been added. Why would you merge so quickly when there’s no one behind you and no one in the lane in front of you? Probably because you’re trying to show off. Once again, showing off gets a driver into a whole mess of trouble. Perhaps the gas pedal got stuck? Wait for the light to turn green before proceeding through the intersection! That’s basic driver safety! Hi everyone! I decided to take a break from Super Speed Friday and do something a bit more fun. As I followed the coverage from NYIAS 2013, my interest in sports cars and super cars was once again piqued. After the show ended, I went to YouTube and began looking up fun sports car videos. Thankfully, YouTube not only pointed me towards great videos of amazing new cars, but also some completely ridiculous sports car “fails” as well. After browsing through videos for hours, I came up with this post. Here are the 13 best sports car videos on YouTube. Some of them are funny, some of them are fun, and I hope you enjoy them all! This is an absolutely hilarious commercial for Dish network featuring a woman, a man, a sports car, and a complete misunderstanding. Keep in mind, some of these might make you cringe. You might think “How could anyone DO that? ?” Or, more to the point, “Why would anyone do that??”. In this first one, the father gives his 14 year old son the keys to his Mustang. The intention is for the child just to pull it into the garage, but then…. Here’s footage of a particularly brainless stunt that you might have already seen on-line somewhere after it recently went viral. A father gave the keys of his Ferrari F430 to his 9 year old son. The child was apparently allowed to drive the car as a “surprise” for his 9th birthday. A review of the Pagani Huayra by the pros at Top Gear. I love this show to begin with, then they reviewed one of my favorite cars. Then again, I suppose that’s what they always do The entire clip is great, but skip to 3:03 to start the Pagani review. Gotta love these guys. I always see guys driving cars that they wish were the Batmobile. This guy took it one step further. Then again, maybe he was on his way to a kid’s birthday party? Let’s hope so. This is one that might make you cringe. The footage is of a Dodge Viper driving erratically, speeding, weaving around traffic, and not paying attention. Then it happened. He couldn’t hit the brakes fast enough. Here we have an overzealous Ferrari driver who takes off from a red light just a bit too fast. This one hurts to watch. Yes, they are about to unload the car using a ramp made mostly of plywood. I don’t know why any of them thought that was a good idea. Two Corvette drivers. They decided to race on local roads in the middle of the day, which is a terrible idea. Thankfully, they didn’t get far. When Rolls-Royce decides to appeal to sports car enthusiasts, they introduced The Wraith. Here is the rather fantastic commercial for said vehicle. Filming this commercial included the use of 100 Nikon digital SLR cameras. Here’s a behind the scenes clip of how they blew up Walter Jr.’s Dodge Challenger in season 4 of Breaking Bad. I love that I was able to work Breaking Bad into this list, it is one of my all time favorite shows. Man wins 380K Lamborghini, then crashes it 6 hours later. Thankfully he got the car insured. Here’s the news story. Ever watched a Ferrari dig itself into a hole? Links to some of my favorite car blogs/websites! 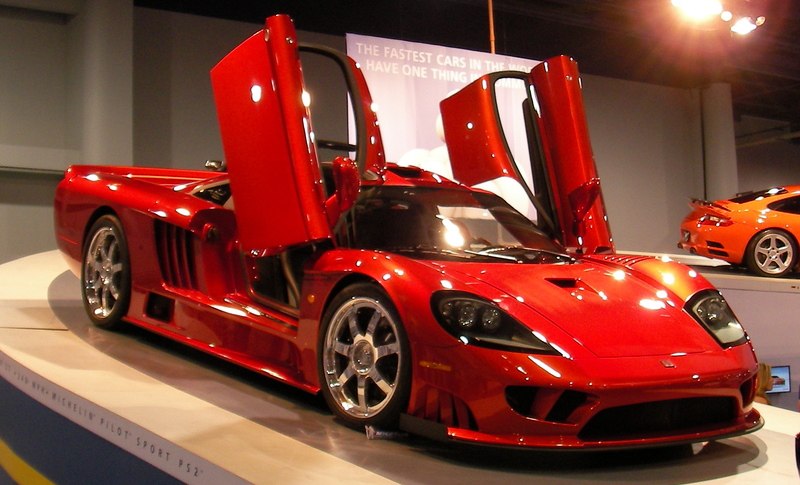 This week’s Super Speed Friday features the incredible Saleen S7 Twin-Turbo. Though only in production from 2007-2009, it remains a powerhouse to be reckoned with in the world of sports and super cars. Let’s begin by looking at it’s predecessor, the original Saleen S7. The S7 was the brainchild of several influential entities in the super car world. The original concept for the car came from Steve Saleen, noted Formula Atlantic and club racer throughout the early 80s. Steve started the Saleen Autosport company in 1983 and, by 1984, had built the Saleen Mustang. This particular Mustang then took first place in the Mosport 24hr race of that same year. With the completion of the S7 in 2000, Saleen Autosport finally had their very own flagship car. Most of the automobiles they produced until then were modified sports cars. The Saleen S7 was intended to incorporate twin-turbo engines when the initial concept model was built. However, when the car went into production, the twin-turbochargers were left out. It wasn’t until 2005 that the twin-turbo was re-incorporated into the design. 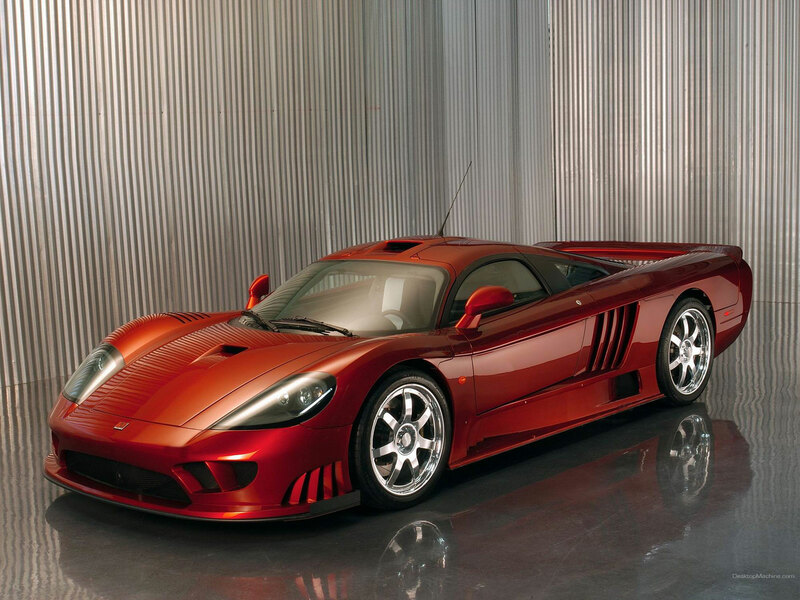 When the Saleen S7 Twin-Turbo was officially released, production of the original S7 ceased. The Twin-Turbo had come home to roost and all Saleen S7s were built that way from then on. Adding the new twin-turbo system gave the S7 a significant bump in power. The overall horsepower was increased to 750, with 700 lb-ft of torque as well. The car that already went from 0-60 in under 4 seconds could now achieve that goal in less than 3. The S7 Twin-Turbo engine rests in the mid-chassis of the vehicle. Not only does that make for optimal weight distribution, but it allows the necessary room for this unusually tall engine. This design also places trunk space for the S7 at both the front and rear of the car. A 3 piece set of custom-fitted Mulholland Brothers luggage originally came standard with the super car. The Saleen S7 Twin-Turbo features a car body that is 100% carbon fiber. The body design is sculpted to be incredibly aerodynamic, creating a “split-clannel” airflow through the car itself. The design improvements are unique to the twin-turbo model. Saleen added a new rear spoiler package, diffuser, and new front fenders. By adding all of these features, Saleen gave the S7 Twin-Turbo a 60% increase in down force. Steve Saleen is even quoted as saying “the car can drive upside down in a tunnel at any speed above 160 mph” because it creates it’s own down force beyond that speed. Steve and his team conducted extensive testing in the wind tunnel at the University of Glasgow, Scotland before making that claim. The interior of the Saleen S7 was also updated when the twin-turbo model was released. Slight changes were made, putting leather and suede to work throughout. Since the S7 Twin-Turbo was only made between 2007 and 2009, it does lack a touch screen infotainment system. However, if you managed to buy one of these cars, I’m sure one could certainly be installed. For a car with this kind of speed and power, you could always add electronics after the fact. One unique feature the S7 comes with is the video “rearview mirror”, a small camera set into the back of the car that displays on the dashboard tv/dvd/cd system. It is also worth noting that the Saleen S7 has a heated windshield. Depending on where you live, that makes scraping off ice a thing of the past. This is truly a super car from the outside in. Every part of the Twin-Turbo S7, from it’s aerodynamic exterior, to it’s powerhouse engine, to it’s posh interior, makes for an ultimate driving experience. Although they don’t make these anymore, seek them out. You won’t be disappointed. There has been so much excitement surrounding the premier of the new Rolls-Royce Wraith that I absolutely had to blog about it this week. As the world of luxury cars expands, the true kings of it will continuously strive to stay on top of their game. Providing consumers with the most luxurious cars is what Rolls-Royce is all about. Truly, they have claimed their spot once again at the top of the ladder with The Wraith. The Wraith was first announced in January of this year and touted as the “car Charles Rolls would choose to drive”. In fact, the automotive pioneer was the inspiration behind this new automotive triumph. Rolls-Royce has always had rather fantastic names for its cars. Silver Ghost, Phantom, Ghost, and now The Wraith will continue that tradition into the next few years. After releasing the legendary Ghost model in 2010, Rolls-Royce decided that they simply could not stop improving their already phenomenal automobiles. Award winning Serbian designer Pavle Trpinac was tapped to design the chassis and the brains at RR began to conceive what was to be their most luxurious, and fastest, car to date. The Wraith was unveiled at the Geneva Auto Show this past March to an absolutely thrilled crowd of enthusiasts and industry professionals. It takes it’s name from the original Rolls-Royce Wraith, produced between 1938 and 1939. Only 492 original Wraiths were ever made. The new version will surely be available to more people than that. The new Wraith features a 6.6 litre twin-turbo V12 engine with 624 hp. It can go from 0-60mph in 4.4 seconds, .3 seconds faster than it’s Ghost predecessor. Compared to the Ghost, The Wraith also has a shorter wheel base and improved suspension, making it the ultimate road ride. Another truly unique feature put into The Wraith is the Satellite Data Transmission. This system pinpoints the car’s location from space, continuously. It can see upcoming turns and shift accordingly, always putting the driver in the right gear for the right setting. No more guessing when it comes to down-shifting, the Wraith does it for you, effectively utilizing every part of it’s incredible engine. The interior of The Wraith is nothing short of mesmerizing. It bears all the beautiful luxury that one would expect from a Rolls-Royce, yet has added features that propel its quality past other brands. The “Starlight headliner” makes the interior roof look like a starry night sky by placing tiny fiber-optic lights into the upholstery. The car doors are traditional trademarked powered RR coach doors. A whole host of new technological features transform the Wraith into a virtual electronic extension of the driver. To the driver’s right hand side is a rotary controller that harnesses the power of the entire entertainment system. The driver also never has to take their eyes off the road, as the Wraith’s steering wheel has push-button voice command technology built into it. The Wraith is such an incredible accomplishment for Rolls-Royce in both luxury and speed. I can’t wait to see how they improve on it over the next few years and what that leads to. More importantly, I can’t wait to hear what they name their next car. It is also worth noting that there was recent speculation Rolls-Royce would expand their current factory to comfortably accommodate production of the Wraith. Just about all RR cars are hand built at their Goodwood factory in Westhampnett, England. While the factory currently produces around 3000 cars a year, the Wraith is sure to push that number up close to 5000. However, the Rolls-Royce factory is located in a conservation area and thus will never be able to expand. About five years ago I had my first dinner ever at Dave And Buster’s. It had been over a decade since I was last in an arcade, and that was just the corner one down the street from my parent’s house. I walked through D And B, between the monstrous machines, and sat down into a car racing game. Twenty dollars later, my love of the arcade was thoroughly renewed and I had a brand new obsession, car racing arcade games. You can take some rather incredible driving risks in those games that you absolutely could not take in real life. My job necessitates a lot of commuting, so I find myself behind the wheel almost as often as I’m riding the train. After all of those hours spent every week ensuring I drive responsibly and safely, it’s a lot of fun to hit the arcade and throw caution to the wind. Last week I had a meeting in New York City and took the group out to Dave And Buster’s afterwards. On the train ride home I got an idea, and decided to write this blog. Here’s a list of 5 particularly cool car racing games that are either currently in arcades or used to be. The first game to hit this list is none other than Dirty Drivin’. DD is a relatively new addition to the virtual racing scene. Release in 2011 by Raw Thrills and Specular Interactive, DD is a one-seater game which can feature the driver in one of ten custom vehicles. That might not sound like very many, but the list of upgrades that are available throughout the game is almost endless. Racers can find themselves tearing up the craziest of tracks, unleashing weaponry on their opponents, or even grabbing on-course power ups to catapult themselves to victory. There is a special, skull-shaped crank next to the drivers seat which, when pulled, releases the power ups that can be acquired throughout the game. Smashing into your opponent is also encouraged. The more points you get throughout the game, the more power-ups become available. The whole game has a wonderfully gritty feel to it that translates into an incredibly fun experience behind the wheel. I’m going to reach way back here and talk about one of the first arcade driving games ever, Hard Drivin’. I never played this game, and I’m sure it has since disappeared, but it’s more than worth mentioning for a whole host of reasons. First of all, Hard Drivin’ is a game that doesn’t skimp on the realism when it comes to driving. This game actually featured a clutch pedal to be worked in conjunction with a gear shift. If the driver couldn’t work those seamlessly, the car would stall in the game and affect the lap time. Secondly, this was the first arcade racing game of it’s time to feature the driving perspective from inside the vehicle. Just looking at this game, I bet it was tough to drive with that perspective. Not for any lack of talent on the gamer’s side, but mainly because the perspective is like a horse with blinders on. When you’re driving the car in the game, you can’t see off to the sides! I’m sure that made it difficult to navigate turns. Then, on top of all that, if you left the road, you had ten seconds to return before your game was automatically over. While this game may have been very accurate and revolutionary in it’s day, I prefer the games that followed it. I like my virtual racing games to be fun, especially in an arcade setting. Now here’s a game I played when I was younger and occasionally made it to arcades. 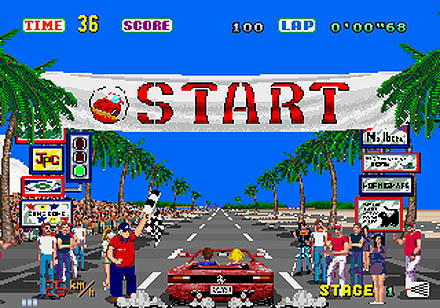 Outrun was truly the beginning of the racing games we see in arcades today. Yes, like Hard Drivin’, this game features a full sit-down cabinet for arcade play. However, Outrun uses the more popular “behind the car” perspective. The seat would also shake and turn along with the on-screen turns and crashes. Outrun made you really feel like the action was happening around you. The game was designed by Yu Suzuki. Yu toured Europe before working on the game in order to add as much realism to the game as possible. Most of the backgrounds and settings seen throughout Outrun are modeled after European landscapes. It wasn’t just a coincidence that the races took you past windmills, the Alps, and rock formations like Stonehenge. The whole point of the game is to escape reality. Let me tell you, driving through the Alps while sitting in a small arcade in Minnesota was definitely escaping reality. Let’s get back to the modern racing games you will find the next time you step into an arcade. This next one is also from the geniuses over at Raw Thrills and it’s called Fast And Furious Supercars. Although Raw Thrills began developing and releasing these “Fast And Furious” games in 2006, Supercars is the most recent addition to the family. It features 10 incredible cars, like it’s predecessors, everything from a Dodge Viper SRT10 to a Saleen S7 Twin Turbo. That’s another thing that makes me love racing games right there, the modern ones feature some of the most incredible cars ever made. Although driving the car in the game is a stretch from the real experience, it’s a stretch in the most fun way possible. Another key difference between Supercars and those games that came before it is the number of races available. While the first Fast And Furious game had only 12 races, Supercars has 27 different racetracks for the driver to tear to shreds. The designer of the game is also the leader of Raw Thrills development studio, Eugene Jarvis. Jarvis originally developed pinball games in the late 1970s for Atari. Inspired by the release of Space Invaders, he sought out to design his own game. Almost thirty years later, he is developing and releasing some of the most incredible arcade games on the market. The final virtual racing game of my post is truly a monster. GRID was released into the arcade world by SEGA in 2010. This game features 12 different insane automotive machines, everything from a Pagani Zonda to an Aston Martin DBR8. The car options alone might make this my favorite of all the games, though the player only has 8 different racing circuits to choose from. The screen on this game is 42”, basically the size of the average flat-screen living room TV. Even when up to 6 of these get linked together, everyone still gets their own 42” screen for game play. Plus, each cabinet also gets its own 2.1 digital sound system and sub woofer. The driver can even switch between auto and manual transmission, as well as several views of the car. So, if you wanted to play it with a Hard Drivin’ perspective, you could absolutely do that. I’m going to call it now. Of all the modern arcade racing games out there, this one is my favorite. Though some other games have more course options, GRID always draws me back with it’s encapsulating construction and fantastic car options. Really, any game that features a Pagani Zonda, that’s a game you’ve got to play. It was really only a matter of time before a Lamborghini entered the ranks of my Super Speed Friday list. This particular post will take a look at the Lamborghini Aventador LP700. Unveiled in 2011, the Aventador was designed to be Laborghini’s new flagship car in their already impressive array of automotive excellence. To look at this car is to awed by it’s design. This Italian built coupe bears all the aerodynamic slickness one would expect from Lamborghini and the engine sounds like a sonic jet taking off down the road. The Aventador even has a start button that looks like a missile launch button straight from a “cold war” movie. Lamborghini typically has always put acceleration and speed at the forefront of their goals when designing and building new cars. However, with this new car they put control at the helm above these factors. While the Aventador can still achieve remarkable speeds, the handling has been noticeably improved. The praise resulting from this slight shift in priorities has been undeniable in the world of car reviews and has brought Laborghini’s brand to a new height. With a top speed of 217mph, the Aventador can go from 0-60mph in under 3 seconds while producing an incredible 700hp. This super speed is produced by a 6.5litre V12 engine. The complexity and cost of the V12 primarily confine it to the sports and luxury car world. Lamborghini has numerous V12s throughout their catalog, though the Aventador contains only the second one built in-house. A single clutch 7-speed transmission by Graziano Transmissioni puts the driver in complete control, even able to accomplish gear shifts in less than 1/10th of a second. Lighting shifting for a lightning speed engine, even with a single clutch. Graziano is also the same gearbox manufacturing company that produced the 7 speed dual-clutch found in the McLaren MP4-12C. The Aventador has three different custom driving options which each have pre set engine, steering, transmission, and differential adjustments. The driver can put the car in ‘Corsa’ (track setting), ‘Strada’ (road setting), or Sport, depending on personal preference and driving environment. A series of buttons on the center console make changing between these options very straightforward. Though this car achieves all the power one would expect from a Lamborghini, and then some, the single clutch shift and console design make it flush with “out of the box” functionality. The interior of the Aventador contains some of the most incredible displays and entertainment options ever seen in the world of sports cars. In addition to what I would call the “cold war missile launch” start button, there is an Audi-MMI based “infotainment” system with a great stereo, bluetooth connectivity, and full navigation gps built in. All of these previous factors combined have resulted in a new height for Lomborghini automobiles. As a result, The Lamborghini Aventador LP700 is selling like crazy. Demand for the car is incredibly high and Lambo is pushing to increase it’s already impressive 600 units per year simply to get closer to meeting demand. Though, for an automotive powerhouse such as this, I think they may never truly catch up with that demand. You might just have to wait to drive one of the most incredible cars ever built. With the media buzz surrounding the recent developments of the Terrafugia Transition, flying cars of the future are closer than ever before. Who wouldn’t want to skip every traffic light, stop sign, pothole, construction detour, and speed trap on your way to work in the morning? Growing up in Minnesota, I can think of many times when flying to work in the morning, instead of driving through the snow, would have made my life significantly less stressful. Not to mention how much easier my parents would have had it, could the moving trucks hover from place to place. With all of that in mind, I took off across the Internet and found 7 cars that fly. This list is everything from designs still destined for production to actual working cars that can one day soon have you hovering over bumper to bumper traffic. When it comes to the future of the family automobile, hopefully where we’re going we don’t need roads. Let’s start with one that is at this time is just a design and a concept. Don’t discount this particular vehicle simply because it hasn’t entered production yet. The design of the Honda Fuz-O is quite realistic compared with other flying cars currently in production. The design revolves around 4 turbines that set the car in motion and also calls for the vehicle to be made from carbon fiber, thus making it super lightweight and requiring minimal power. The Fuz-O concept includes seating for three, while most other flying cars in design and production seat two people at most. I think the main appeal of this particular design is that the resulting vehicle is more of a hover car than a flying car. Imagine if you never had to shovel the driveway again, that could be a reality with a hover car design like the Fuz-O. Now let’s look at a flying car that may be on the road much sooner than you think. The Terrafugia Transition flying car was unveiled in 2012 and already has 100 pre-orders at $279,000 a piece. 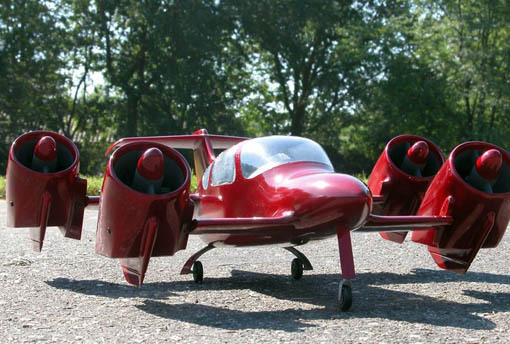 This “roadable airplane” can drive up to 70mph on the road with normal traffic and it’s folded dimensions are designed to fit inside the average size home garage. This model has a much more traditional airplane design to it. Since you will probably have to get a pilots license to operate a flying car of this sort, it is no surprise to me that there are only 100 orders so far. Although Terrafugia expects 2013 to be a great year for the Transition, they are still holding off on the actual street date for the time being. The SkyCar is essentially a souped up dune buggy that acts as a massive paragliding machine, having a parafoil and parawing attached so that it will sustain flight level. It can take off in less than 500 feet and reach heights of over 2000 ft. Although this car is street legal, perhaps it’s best use is for having fun offroad. When I was growing up, my parents lived on a very large plot of land outside the city. My father got more and more into off road vehicles and hobbies over the years. He even went to far as to build a full off road course out behind the house. Since I had no brothers or sisters, I often rode with him. I wish we had one of these back then. Yee Flying Car : SCUT students design the future. While this one remains purely in a conceptual state, the YEE flying car is absolutely worth mentioning. I think with every new design the entire idea gets closer to reality. This car, which came from the minds of three South China University of Technology students, is an award winning design with a definite future in the vehicle marketplace. The wings fold in while driving on the road and are equipped with small wheels along their edges, keeping the wings smooth to the road and off the pavement. The designers envision the car “taking off” with business professionals who are forced by income restraints to live outside of town and need a quick way downtown. However, no retail price has been released for this vehicle, so that demographic may not be accurate. Now here’s a car that’s straight out of a modern science fiction movie. The Hammerhead can take off and land vertically, unlike the Transition, and is described as being fast, safe, lightweight, and user friendly. The two forward fans on the vehicle can tilt for both thrust and lift. It also seats one person, which puts it in line behind several of the cars mentioned on this list. I think the first truly marketable flying car will need two seats to achieve commercial success. Although The Hammerhead may not be able to fit in your garage and is a few steps behind the other flying cars in production, it’s still a flying car and an incredibly cool looking one at that. My uncle has always been an X-Files fan and tried for years to convince me that aliens and flying saucers are real. I would absolutely love to one day land a Hammerhead in his backyard and see what happens. Moller International has stepped into the flying car ring in a big way with their Skycar 400. This sports car looking “flying car” is capable of air speeds over 350mph and runs on ethanol. I also find this design particularly intriguing, as I’ve worked on many muscle cars in the past. This is one of the few flying cars that has a real street car look to it, and I think that will help push it towards commercial success. Moller takes a very pro active feel to their campaign, saying “No matter how you look at it the automobile is only an interim step in our evolutionary path to independence from gravity.” That is a very bold and confident statement coming from a company developing a flying automobile. I like companies that exude confidence and I am anxious to see where this particular project goes. Who says it has to be a flying “car”? Although motorcycles that fly might be a bit further off commercially than flying cars, hover bikes have taken a giant leap toward reality in the last couple years. Test flights for the Aerofex Hover Bike have not yet exceeded 30mph, which is still pretty good for a bike that requires no pedaling. Two large fans beneath the bike keep the rider up to 15ft off the ground. Not only does this particular vehicle cost less than any estimated flying car, it satisfies one of the greatest dreams of every single Star Wars fan out there. This looks like the closest you’re going to get to feeling like you’re zooming through the forests of Endor. 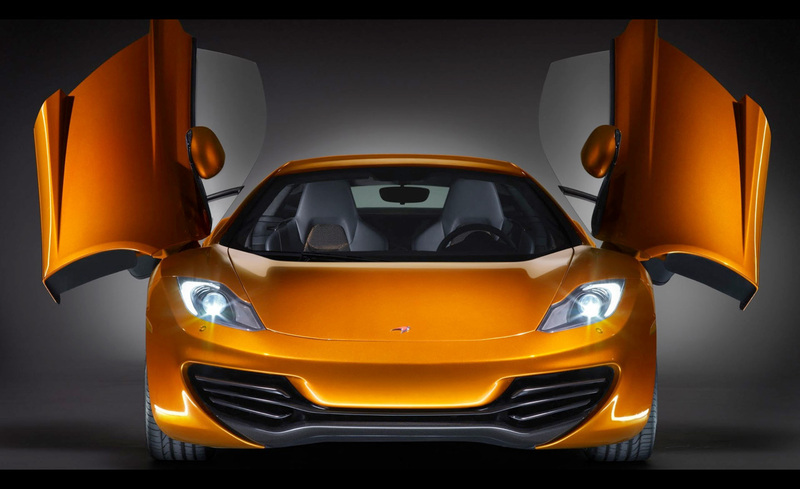 British automakers continue to dominate the ranks of Super Speed Friday with the 2012 McLaren MP4-12C. McLaren Automotive was founded in 1989 and originally produced Formula One racing cars. They established a reputation early on for knowing speed in a way that not many other car companies did. McLaren’s first car was the F1, a 2 door coupe produced from 1992-1998. In March of 1998, McLaren’s F1 became the fastest road car in the world, setting the record at an incredible 231mph. It would be a decade after that before McLaren unveiled their next supercar, one solely designed and built by themselves. Development of the McLaren MP4-12C began in 2008 and the car made it’s first appearance in 2009. Although the MP4-12C has a very traditional sports car design, the tricks that lay within the frame are numerous and near-revolutionary. As brainchild of noted car designer Frank Stephenson, the McLaren MP4-12C introduces some incredible new ideas and concepts to the supercar world. Most notably, the comfortability and handling have been improved in some rather remarkable ways. The number one thing that every reviewer has said about the McLaren MP4-12C is that it’s comfort level is unparalleled in the world of the supercar. In an industry with such strong competition (Ferrari, Porsche 911 Turbo), taking things to the next level is both encouraged and rewarded. When the MP4-12C was in development, McLaren had it in their collective minds to produce an automobile that would appeal to the consumer based on versatility. They wanted the MP4-12C to be seen as the blending of performance and everyday driveability, a car brought from the racetrack to the road. McLaren also continues their tradition of blazing speed with the MP4-12C. It hits a top speed of 207mph, goes from 0-60mph in 3.1 seconds and boasts 592 horsepower, all while achieving the best fuel economy in its class. This incredible performance comes from the car’s twin-turbo 3.8 litre V8 engine. The shifting is controlled with a 7 speed dual-clutch transmission that is called the SSG or “Seamless Shift Gearbox”. This system has a truly unique feature in which the driver may pre-select a gear by gently tapping the shift paddle. I think that features which allow for advanced shifting are truly the future when it comes to the advancement of the supecar. Just as the MP4-12C has pre-selection of gears, the Ariel Atom 500 achieves its blazing speed with it’s advanced paddleshift system, allowing for 5 downshifts in less than a second. Control has always shined as a sought after commodity in the supercar world and it continues to be pushed to new heights. Such an excellent super speed system is accompanied by an incredible suspension system. The advanced handling of the 2012 McLaren MP4-12C is made possible by a Proactive Chassis Control system (PCC) featuring Adaptive Dampening. This allows the MP4-12C to achieve an incredibly smooth and comfortable ride, along with optimal control, even at high speeds and over the most jarring of bumps. McLaren has also put in place a “brake steer” system. This system was originally used on their Formula 1 racing car, the McLaren MP4-12, but was banned because of it’s performance advantages. Brake steer was developed to improve traction on the MP4-12C and puts the brake automatically on the inside rear wheel while going fast around corners, severely dampening under steer. The design of the 2012 McLaren MP4-12C is largely traditional to the sports car look. It has a sleek, aerodynamic design, no doubt sculpted to perfection by a company known for such attention to detail. Even the door design of the MP4-12C enters some especially interesting territory. Although I am partial to gull-wing doors, I must admit, I enjoy the MP4-12C’s dihedral door setup. This “butterfly door” design is used often across the sports car world, from it’s induction with the ’67 Autodelta Alfa Romeo Tipo 33 to the 2013 Ferrari LaFerrari. The dihedral door design makes it easier to get into and out of the MP4-12C, yet another example of how McLaren is a master in car comfort. The interior of the car bears the design of a Formula 1 race car. Although, unlike the McLaren F1, the MP4-12C features coupe style side-by-side seating, with the driver remaining close to the center of the car. All of the console controls are easily within reach of the driver, as well as the 7” telematics screen, which features bluetooth connectivity and voice recognition navigation technology. There is also a 4 speaker stereo with a USB port, iPod/iPhone integration, and speed sensitive volume control. Alloy and leather trim decorate the doors and center console, while several different colors and fabrics are available for the hand stitched interior. When I consider all of the points made throughout this post, how could the 2012 McLaren MP4-12C not make my Super Speed Friday list? Indeed, it belongs in the top 5.